This is a short section in homage to Donald Josar - who preferred the name DJ. 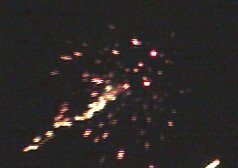 DJ was a gentleman and an avid pyro who popularized nozzleless rocket designs for a few years in 2000-2002. 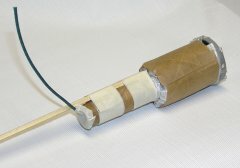 DJ has passed away but has left a nice mark in the pyro world..
Would you like to make a motor that is almost fool proof and REALLY hard to CATO (at least for the 3/8" version and see rockets.html for exceptions)? Here you go! As you can see - it really is quite simple. There is no nozzle and no bulkhead. You can use normal rocket tooling but you must juice up your BP to as fast as you can make it - see nozzleless fuel on the compositions page. I use a modified 'Tree of Heaven', willow, paulownia, white ash, or other hot charcoal BP for sizes up to 1 1/2" - six pounds (again, see nozzleless fuel for how it is made). Because there are no bulkheads, there is about 15% more fuel in the motor than in a standard design. Within narrow limits, these designs fly as well with a light load as with no load. Light motors lose forward momentum fast and a small payload tends to help 'keep it going'. Once a bare-bones motor is done burning its propellant, all that is left is a hollow tube and a stick to carry the motor upwards. With a payload, you have stored energy that tends to keep the whole shebang going. The most intriguing part when experimenting with these motors is their sound. It is quite a bit different than a nozzled motor - try it and see. Safety Tip: These designs are inherently more susceptible to premature ignition from sparks or from lighting their fuse. The core is open to the air at the bottom. It is best to tape the fuse to the bottom of the motor - thus covering the grain. The top should also be taped if flying the motor without a payload. Above is a 5/8" motor. The fuel was hot willow BP dust (fresh from the ball mill - not made to pulverone) with 3% mineral oil. The mineral oil tends to make it easier to compact, allows it to hold its shape, and makes it much less messy. This one was pressed and not rammed . Here is the motor on the left hooked to a #100 ball shell. The shell was filled with kitty litter and the total weight of the rocket was 137 grams. 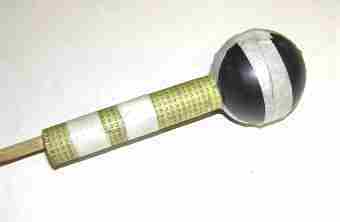 The stick was about five to six times the length of the motor. Click on the above image and watch it fly. 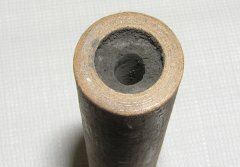 Here is the end of a nozzleless rocket motor that didn't have mineral oil in the BP. Note it is a bit scabby.. But it is still good. See the frame below! Here is a 3/8" motor hooked to a spiked film can shell (FCS). Note the taped fuse hookup to prevent accidental ignition of the bare fuel grain. 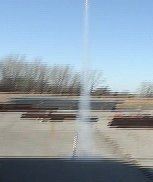 Click on the above image to see a couple of examples of nozzleless rockets in flight - These are 3/8" versions as described in the above paragraphs - both use Tree of Heaven BP as the fuel and RP with titanium as the delay grain. One of them is the rocket in the above right picture. Here is the same motor only with whistle as the delay. This idea was borrowed from Dan Thames - who posted some of his results on the r-bp yahoo group. Click on the picture below to see it launch. Be sure to leave about 1-2" space for the whistle to develop. Let's get serious. 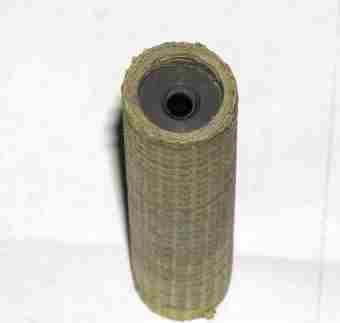 Click on the following picture for a video of a 4lb nozzleless lifting a 6" shell. This used Meal-D and 3% mineral oil. It was my motor and shell - Dan Thames was the photographer. 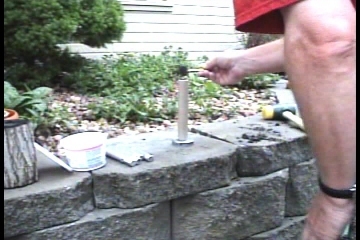 Finally - click on the above photo to see a short (3 minute) tutor on how to make a nozzleless rocket motor. For these motors, I like to put 3 increments (about 13.5 grams) of delay on top. The delay is pine green mix +10 Ti and +3 mineral oil. I then put a clay bulkhead on that to insure the motor doesn't blow through. 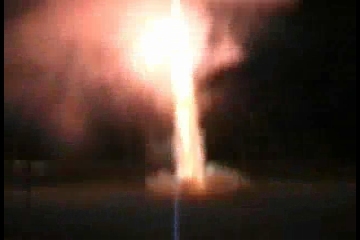 The mix burns at about 3 seconds per inch so a light high flying rocket may need another increment. I now prefer to press them to 5000 - 8000 pounds but you can still ram them and get it to work just fine - be sure to use small increments when hand ramming. 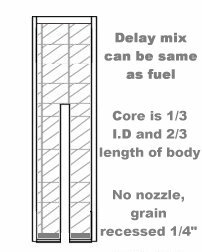 With a set delay on top, the passfire can be adjusted by hand drilling into the delay mix or fusing the header externally. However, the specified delay works fine for a festival ball shell or nice salute.